This practical guide offers innovative tips and reliable best practice to enable new and experienced library and information professionals to evaluate their current provision and develop their service to meet the evolving needs of the research community. Interacting effectively with information is at the heart of all research, consequently information professionals have a key role to play in facilitating the development of researchers who are able to operate confidently and successfully in the information world. Grounded in current theory and informed by practitioners from around the world, this practical book offers a wide range of ideas and methods to assist library and information professionals in developing and managing their role in the research environment. Part of the Practical Tips for Library and Information Professionals series, the book is organised into eight sections: landscapes and modelsstructures and strategiesplaces and spaceslibrary staff rolescollectionsspecific interventions in the research process or lifecycleteaching approachesinformation literacy skills workshops and programmes. Practical Tips for Facilitating Research will be essential reading for academic liaison librarians, research support librarians and all library and information professionals who work with research staff and students. Benefitting from Bent's exhaustive research and robust content, this volume will be very useful for academic librarians, particularly subject and faculty liaisons and instruction librarians. 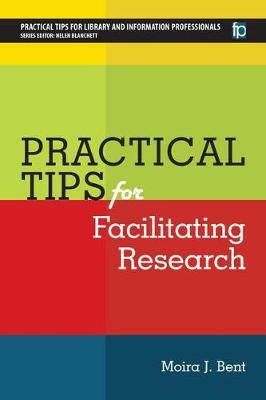 Practical Tips for Facilitating Research is an excellent tool for librarians who want to be a resource for the research groups within their facilities. I would highly recommend this book to any librarian working with researchers in the health sciences, and to many of our colleagues working in other disciplines, for that matter. The book is short, realistic, practical, easy to read, and extremely useful for generating ideas. As for me, I am still starry eyed. I know I will be referring back to this book and my copious marginalia for the foreseeable future-that is of course until my colleagues start asking to borrow my copy!